We work together and decide what budget, size, style, floor layout is best for you. 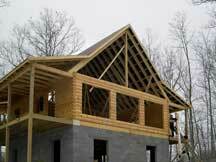 We will provide a FREE WRITTEN QUOTATION on your custom Riverside Log Home. If you decide the timing is right and you want to go forward - then we go to step 2. We will prepare a written contract for your custom Riverside Log Home. You sign and deposit the required amount on the contract. This locks in the price and puts your name on our construction calendar. We cannot hold a calendar date open or guarantee the price without a signed contract and deposit. 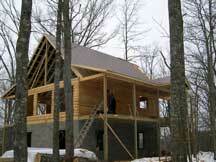 We then order the custom building blueprints for your Riverside Log Home. You then review the drawings and blueprints to be sure they are exactly what you want. Then you approve the plans by signing or initialing. 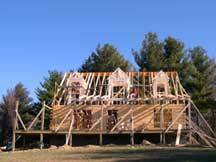 Now, you coordinate your onsite work to be ready for construction of your Riverside Log Home. Grading work, well drilling, installing septic system, and building roads are the responsibility of the homeowner; however, we will gladly assist you if needed. Then comes the building stage. Riverside Log Homes uses premium air dried Eastern White Pine logs because of their beauty and properly preserved logs against the elements are no match for the durability and practicality of solid Eastern White Pine. Eastern White Pine is probably the least resinous of all pines. It does not swell or shrink significantly with changes in moisture conditions. Eastern White Pine is also plentiful in our area and combined with its desirable characteristics help make it most affordable and most used wood species in the log home industry today. 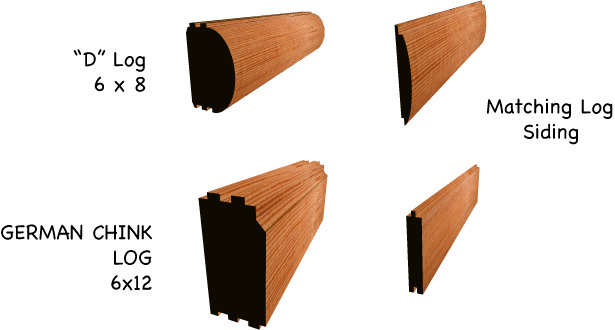 Riverside Log Homes also offers other species of wood and a variety of log profiles.